The ultimate Passover Digest by Rabbi Blumenkrantz, for 5779 – 2019. Laws of Passover. Updated every year. 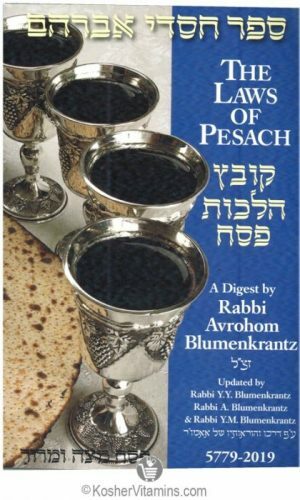 The Laws of Pesach, by Rabbi Blumenkrantz is well known by all in every continent. It’s all about pesach. What is kosher for pesach and what is not. Rabbi Blumenkrantz writes in a clear, friendly format, simple for anyone to navigate. Does not qualify for free shipping. Please call the store to place your order.